Arden Grange Grain Free Adult Cat Food (Chicken & Potato) is a wholesome and complete diet for all breeds of adult cats with normal activity levels. Made with generous helpings of fresh chicken and a unique blend of nutrients and natural supplements, the highly digestible diet helps promote the optimum health, vitality and condition of your cat. I have been using this food for a few years now and all 7 of my cats do very well on it, also the fish version. I show my cats and their coats always look in good condition and have been commented on at the shows. I give the small bags in the goody bags with my kittens when I have any. When I got two Siamese kittens last year, their breeder recommended Arden Grange kitten food which they were already used to, and as they grew older I gradually introduced the adult variety, perhaps a little sooner than I should have, but I already had one adult cat with tummy problems on another make of food, and I was keen to change him to the Arden Grange to see if he improved. He did! So I now only buy the adult variety of this food and the kittens (now both over 9 months old) actually prefer it to the kitten version. They all have lovely coats, stools are firm, and they get through this at a rate of knots. I feed it ad lib so they can take as much or as little as they like, whenever they like. I love the fact that it is grain free, and feel happy that the adult cat with the tummy problems has gained weight. The kittens are full of energy and the adult, now 13, is playing like a kitten again. I certainly recommend this food and have no reason to change my cats to any other now. At long last I've found a healthier alternative to go-cat etc. ALL my kitties are enjoying this and are looking well. Just a shame it doesn't come in a larger size. Good quality reasonably priced food. I buy this quite often for my 5 cats & they all eat it quite happily. I find that it doesn't last as long as the top end cat food but it's not as expensive so this makes sense to me. My cat Ben will be 18 years old next month and has had this food from being aged 4 years old until 3 months ago when he was diagnosed with kidney disease meaning he now has to have a Renal Food to help with his kidney problem. Before Ben went on to Arden Grange myself and the Vet had terrible trouble trying to find a food that suited him, my Vet then asked me to try Arden Grange for him and as we didn't have a stockist near to where I live, my Vet even bought it for me to try. After using 2 small 2 kg bags I then ordered it directly from Arden Grange by telephone not having a computer then, once I had a computer I could chose who to order it from and found VetUK very reliable and also very competitive price wise. I would 100% recommend this food to any cat owner, my cat absolutely loved it and thrived on it. Ben still has some of his 7.5kg left so is still having a small amount mixed in with his Royal Canin renal dry food because I didn't want to waste it and there is no cat owner who lives close by me. I was so sorry when Ben had to go on to a different food in case it bothered his tummy as other food had done in his early years, but thankfully he has taken well to the change over to Royal Canin, he has both wet and dry of that food and loves the Tuna wet food the best, but he will eat all 3 varieties of the wet food. 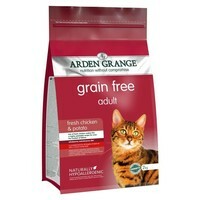 If your cat has any problems digesting any foods try Arden Grange Adult Chicken and Rice this worked for my cat when other well known foods had failed, I cannot praise it enough.